Here is another file by me for rom hacking. 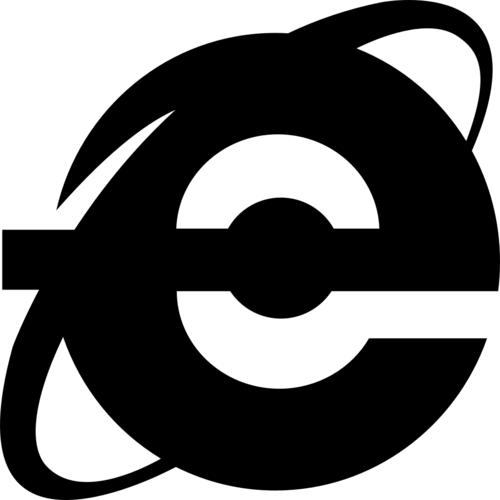 It is a hybrid Parody of the Windows 8 Internet Explorer logo and the GBA e-Reader logo. As both things died out with a bad reputation, and are significantly different from this, I did no wrong. I also used a Public Domain Wikipedia version of Internet Explorer's Metro Logo, which I modded in GNU Inkscape with 2 simple polygons, (a circle and rectangle,) so as to resemble both logos as an allusion to the Mobile System GB, which had webmail ability. I feel that this makes a perfect joke, and I colored it to black to avoid robots falsely flagging it as copyrighted, when I made it using PD resources to resemble abandoned tech, therefore resulting in no legal trouble. It is in SVG vector format at 256x256, so it will need to be rasterized and recolored to blue to work in a hack before resizing. It cannot go as small as the original, but it is still able to go down to 32 or 64x instead of 16x. It also works at 1bpp, so use as you wish. I offer it as Public Domain under Creative Commons CC-0 PD Dedication. Use it for making distro cards, custom pokedex cards, DS homebrew for Lites with E-readers, and Gamecube Homebrew with anything you want on the cards. This will disclaim it from a real card due to its shape. A bit unoriginal, but still nice.